Power flushing central heating systems is a very important part of ensuring our clients heating continues to work effectively. Dirty black or brown water present when bleeding radiators. Radiators slow to heat up due to blockage. Radiators cold all over due to blocked valves and pipes. Radiators cold at the bottom due to black sludge build up. Little or no hot water due to blocked pipes and heat exchangers. Boiler cutting out and no circulation due to blocked pump. Radiators cold at top and need bleeding due to gases, a bi product of rusting. Having to bleed radiators regularly. Irritating boiler noise from sludge or lime scale build up – a warning sign of imminent costly problems. If you recognise any of the above, then your heating system may be in need of a chemical power flush. We can carry out chemical power flushing without any mess or major upheaval due to our Kamco power flush machine, which enables us to connect to your system central heating pump or radiator. This enables us to flush the whole system without having to remove all of the radiators and create unnecessary inconvenience. 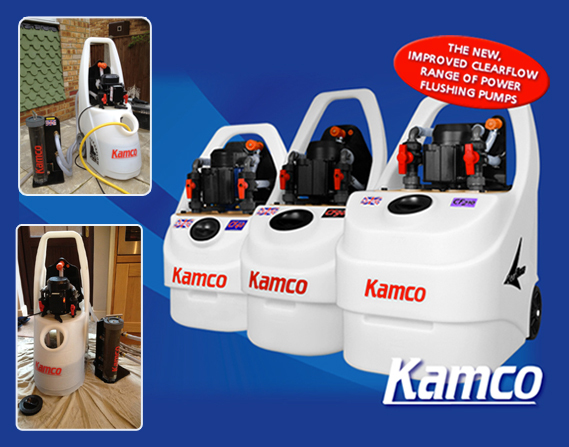 We have had the relevant training from Kamco and are members of the ‘Powerflush Association’. As can be seen from the picture, our Kamco magnetic filter is fitted in line with the power flushing machine, it will then catch and trap any sludge passing through the system, removing any iron oxide (sludge). Whilst power flushing we add a sludge remover chemical, which dissolves and mobilises the rust, along with any sludge and corrosion deposits which accumulate in central heating systems as a result of gradual decay. Once we have all the sludge removed from your heating system, we flush the system with clean water until each radiator runs clear and the PH levels are correct – we then neutralise your system with the correct dosage of Fernox F1 inhibitor. All boiler manufacturers now advise that heating systems should be power flushed on new boiler installations. If power flushing is not carried out it could invalidate the boiler warranty. Does power flushing systems work? My boiler heat exchanger is blocked with sludge. Will power flushing my central heating system fix this? Will a power flush increase my central heating's efficiency? Does power flushing cause leaks? Who demands that systems should be power flushed and why? Can't I just drain the system down and refill it instead of power flushing it? Depends on the level of rust in your system. If you have never had a power flush done, your system probably needs it. The only real way to know if you need one done is to have an engineer visit . If you need a professional to have a look / give an opinion on your system and your water quality we offer a free consultation. Yes they clean the system internally. This stops further damage and future breakdowns related to sludge. It will depend greatly on where in the boiler the block is and the boiler layout. Some boiler makes are easy to flush clean, other cannot be flushed clean at all. Yes, the amount depends on on how much sludge it had in it before the flush. Sludge is a cumulative name for rust and debris found in your central heating system water. Not that high a risk. – Most boiler insurance schemes will want your system power flushed as standard. – Manufacturers of your boiler, before they do any work. – Plumbers that can see it has not been done on your system. Why? Most central heating problems relate directly or indirectly to sludge or lime scale in your system. Eliminating that would make problems easier to diagnose and prevent future problems from occurring and limiting repetitive future callouts and breakdowns. If you have a real sludge problem “NO”. Sludge is metallic rust and the bits causing problems are large clumps that are heavy. Draining a system down will only get rid of the finest lightest sludge; the real problem will be left behind. Just because the water runs clean does not mean all the sludge is out. Some plumbers will do a chemical flush; they add a chemical, days before draining the system down. It doesn’t work because there is no increase in the water’s flow rate and draining happens through just one flow path, when there are many flow paths in the system. It will help a little if the problem is small but 90% of the time, you are wasting time and money.